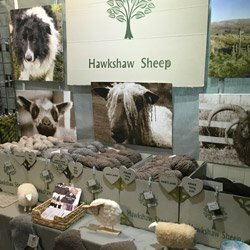 Hawkshaw Sheep produce bespoke limited edition undyed natural coloured yarns and tweed cloth, all with full provenance. Some of the yarn has been over dyed which produces lovely heathery shades that compliment the natural colours beautifully. We also have roving for the hand spinners and felters.